If you’re interested in starting an online store, you’ll want to choose a reliable ecommerce platform that is the best fit for your business. How do you decide which is the best fit? There are a lot of great ecommerce platforms for small and enterprise businesses that have a nearly perfect 100% uptime, thousands of happy merchants, and are mobile friendly, and this article will compare three of them: Shopify Plus, BigCommerce Enterprise, and Craft Commerce. Both Shopify and BigCommerce are known as software as a service, or SaaS, tools. This means that the software is licensed to you (the merchant), and hosted by a third-party vendor. They will maintain all aspects of the software like updates and security patches, it’s basically up to you to just run your business and they will take care of the rest. Over 3,600 businesses, including Rebecca Minkoff, KYLIE, and MVMT, use Shopify Plus, Shopify’s enterprise solution. This ecommerce platform specializes in hosting online stores that sell consumer products, such as apparel, cosmetics, and electronics. They have many website templates tailored to these industries. Also, Shopify offers additional features that directly benefit these industries. For example, beauty products and electronics are known for pop-up shops and extravagant live product drops. If your business is exclusively online, the logistics of a physical store could be unmanageable, but Shopify offers a universal point of sale (POS) system that allows merchants to take their store offline. Shopify is perceived as a simple platform because of its drag-and-drop interface that doesn’t require much development skill. This can be a drawback if you want to customize your online shop further than one of Shopify’s 100+ templates. Shopify uses its own programming language, Liquid, to create templates, so creating a template exclusive to your site is not a simple task if you do not have a developer on hand. Without a developer, you might run into other issues on Shopify. Websites hosted by Shopify often experience underlying search engine optimization issues, one of which is duplicated pages and content. Search engines will not show duplicated content in search results, therefore, this Shopify SEO quirk will harm your website’s traffic. While this is an easy fix for developers, if you do not have a developer you might not even notice that this problem is happening. Similar to Shopify Plus, BigCommerce Enterprise offers over 80 website templates that allow basic modifications for your store. Retailers that use BigCommerce include Gibson, Kodak, Toyota and, CamelBak. New merchants can set up an online store with BigCommerce Enterprise in 50% less time than comparable platforms, and at a quarter of the cost. The platform also allows for an easy migration from another ecommerce platform if you’re not new to ecommerce and are just looking for a switch. Over 20,000 stores have migrated over to BigCommerce from another ecommerce platform using their bulk product importer and catalog transferring resources. One of the best features about BigCommerce Enterprise is their extensive list of conversion rate optimization tools. Once you get shoppers onto your site, you’re going to want to convert them into customers, and that is when these tools come into play. The platform allows you to include product reviews throughout your site, which increases sales by 18% on average, save shoppers’ abandoned carts and then send customized emails with couponing to motivate them to complete the purchase, and many more features which can be found on their website. Also, BigCommerce is the only ecommerce platform with PayPal One Touch built in, which streamlines checkout for PayPal shoppers, simplifying the process to a single click. Security is important to any digital or physical business, and BigCommerce boasts their bank-grade security. This level of protection would cost merchants $5,000 a month on a self-hosted platform, and it comes included with the monthly fee to use the platform. 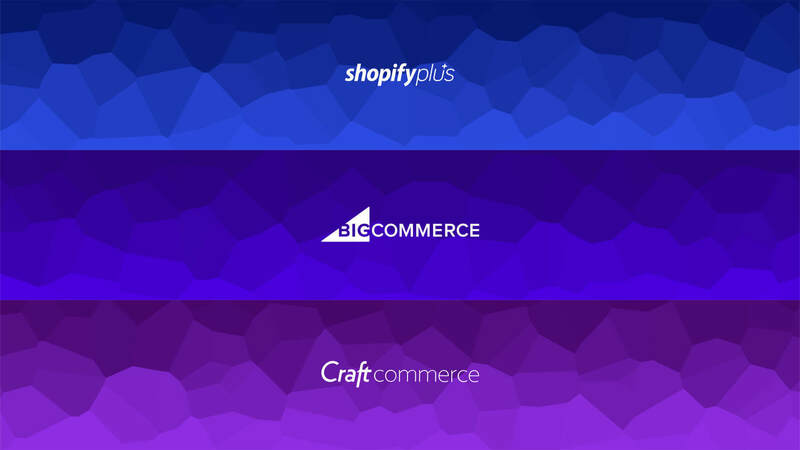 Shopify Plus and BigCommerce Enterprise have hundreds of app integrations to help you run your business, such as MailChimp, QuickBooks, and many of the popular review sites. Also, they both offer 24/7 account support to merchants, which is an indispensable feature for businesses new to ecommerce to have. Although, this service comes at a price. There is not a definitive price for both of these platforms because different ecommerce websites require different features, but Shopify Plus begins at $2,000 a month, and BigCommerce Enterprise costs at least $500 a month. It is suggested to have a developer with a Shopify or BigCommerce, albeit you do not need one when using a SaaS ecommerce provider. On the other hand, you absolutely need a developer to run an online store on an open source ecommerce platform, like Craft Commerce. This might make it out of reach for a business that is new to ecommerce and does not have a developer yet. The customizable CMS of an open source platform gives you complete control of the design and development of your website, so your ecommerce site will be the best fit for the needs of your business. Your Craft Commerce online store can be fully integrated into your preexisting Craft website and share its domain name, user accounts, templates, and content to create unity between your sites. The platform offers many ecommerce specific features that you can integrate into your store. From product management to sales and promotion to checkout to abandoned cart management and shipping, and everything in between, your Craft Commerce website can be modified to include whatever your store could possibly need. While SaaS ecommerce platforms are limited to what the software offers, ecommerce sites hosted on open source platforms can be built around your goals and visions. If you check out Craft Commerce’s features and don’t see a feature your website needs, it’s not an all or nothing situation — it can be built. In addition to the standard support you receive building your website on Craft Commerce, there are other options for design and development support through other Craft Commerce merchants. The Craft community is very active on the #craftcommerce channel on Slack, a messaging app used by many businesses, and is always willing to answer any questions or help solve any problems other Craft users are having. Craft Commerce is a one time charge, unlike Shopify and BigCommerce’s monthly fees. $999 covers your ecommerce website’s licensing, and after that, $199 a year will cover any updates. While Craft Commerce will cost you less in hosting than competitors, it’s important to remember you will not have the same level of merchant support as other ecommerce platforms. Design and development are also completely in your hands, allowing you to have total control of the look and functionality of your online store, making it unique to you and different from templated ecommerce websites. Now that you better understand the differences between ecommerce platforms, whether it is a SaaS or open source platform, you can hopefully make a decision about which one would be best for your business. If you have any further questions, Electric Enjin is the ecommerce expert, learn more about our ecommerce service here.